Looking for Cincinnati Kids Eat Free Deals? Tuesday night seems to be one of the most popular Cincinnati “Kids Eat Free” nights. Also, some restaurants offer two free kids meals with an adult purchase versus just one so it’s always a good idea to double check the dining deals before you leave since any offers listed are subject to change. Also, some of the restaurants may not include drinks so if you are on a budget, water is always a great option. The age range varies based on the restaurant but it’s usually either 12 and under or 10 and under that can eat free. The deals are good for dine in only too. 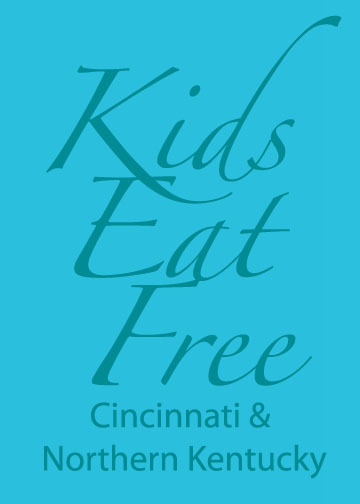 We’d love to keep adding to our list so if you know of another “Cincinnati Kids Eat Free” place or great deal, leave us a comment so we can keep track of them all. Remember all dining deals are subject to change so before you make the trip with all the kiddos, give them a call to confirm the deal is still valid. Thank you to our great readers for all their input. We’ve added Reader Recommendations to the post. NOTE: Because restaurant promotions are constantly changing we recommend calling the restaurant before heading out, just to make sure. We’ll do our best to keep this updated, but just in case…. call. Skyline Chili locations across the Tri-State also offer Kids Eat Free Nights. Nights vary by location so check with your local Skyline restaurant to see what night it happens! The Blue Ash location offers a Monday Kids’ Eat Free night. Wednesday is also another popular night. Buffalo Joe’s in Fairfield – Kids eat free on Monday’s and Wednesdays with the purchase of an adult entree! El Cholula Mexican Restaurant – Kids eat free on Sundays and Mondays with the purchase of an adult dinner. 11928 Montgomery Road, Cincinnati, OH 45249. 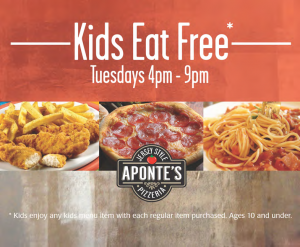 Aponte’s Pizzeria — Located in Mason, Ohio Aponte’s has a Kid’s Eat Free night on Tuesday’s from 4pm-9pm. Kids enjoy any kids menu item with each regular item purchased. Ages 10 and under. 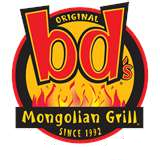 bd’s Mongolian Grill – Thanks to the Savings Lifestyle for finding this great deal. From 5-9pm, you can get one free kids meal for every adult meal purchased (includes a kids’ drink). 8655 Mason Montgomery Road, Mason, Ohio 45040. (513) 770-4330. Brazenhead – Kids eat free on Tuesdays. We like visiting Brazenhead since they have a kids fish & chips on the menu that my oldest loves. 5650 Tylersville Rd., Mason, Ohio 45040. (513) 229-0809. Bob Evans – We’re not sure how long this is going on so double check with your local Bob’s but they now have kids eat free on Tuesdays after 4pm. Good for one free kids meal with an adult meal purchase. Digg’s Bar & Grill – One child eats free with purchase of adult meal. 854 Reading Rd., Mason, Ohio 45040. (513) 770-0708. Tuesday night is also trivia night. Gold Star Chili – The Mason location offers kids eat free on Tuesday nights (many other Gold Star’s also offer this but double check with your local restaurant). Kids 10 and under can get a free kids’ meal with an adult combo purchase. The meals include a drink and they get to pick a cookie pack or fruit snack for dessert. IKEA – A visit to IKEA is a great way to spend the day. Before you eat, have your kids visit Smaland (on site safe and fun monitored play area) while you shop. Then head up to the cafeteria and get a kids’ meal. On Tuesdays (new change) , kids 12 and under eat free at the West Chester location only and no adult purchase is required. Wow. On the other days, the kids’ meals are only $2.49 (still a bargain). 9500 IKEA Way, West Chester, Ohio 45069. (513) 779-7100. Moe’s Southwest Grill – Another great find by The Savings Lifestyle. After 4pm, kids get one free meal with each adult purchase plus the drink is included and bonus….they get a cookie. 8260 Arbor Square Drive, Mason, Ohio 45040. (513) 770-0696. Rusty’s Ristorante – I really want to try Rusty’s Ristorante since they offer Italian dining and what kid doesn’t like pasta? One free kids meal with each adult meal purchase on Tuesday nights for kids 12 and under. Drinks are included. 8028 Blue Ash Road, Deer Park, Ohio 45236. (513) 793-6881. Tom + Chee – I love Tom + Chee, just wish it was closer to Mason (hint hint) and we know Amy Q. loves them too (see her past post). They now have kids eat free on Tuesday. Yippie! Here’s the deal: “Free kid’s meals on Tuesdays with the purchase of any combo meal (limit 2 kids meals per adult combo meal).” They also have “Bring a Buddy” Monday: “Buy any Grilled Cheese and get a second Grilled Cheese for 1/2 price! (1/2 price offer good on grilled cheese of equal or lesser value)”. They now have three locations – Newport on the Levee, Downtown (133 E. Court St.), and Fountain Square Downtown – double check their website for hours of operation. UNO Chicago Grill – Kids 12 and under get one free kids meal per adult entree all day. Two locations in Cincinnati: Union Centre – 9246 Schulze Dr., West Chester (513) 942-6646. Anderson Towne Center – 7578 Beechmont Ave. (513) 231-5357. Max & Erma’s – “Max and Erma’s offers 1 free children’s meal per paying adult on Tuesdays.” – Kellie Sassin Eckhardt via Facebook . Some locations even offer Kids Eat Free on Wednesdays so make sure you call the restaurant in advance before heading out. Here’s a link to an October 2010 PDF on various locations offering Kids Eat Free. Lonestar Steakhouse – Valid all day on Tuesday, two kids eat free from the kids’ menu with the purchase of any entrée. – Thanks for the tip JoAnn. Texas Roadhouse – The Milford, Ohio location has $.99 kids’ meals on Tuesday. Two kids can eat for $.99 each with each adult meal purchase. Not valid on Ranger meals. – Thanks for the tip Candace L.
Bourbon House Pizza – Located in Florence, KY – Tuesday night kids’ eat free (selected food items) – Julie P.
Applebees – Kids can eat free all day at the Mason location on Wed. – one free kids meal with each adult meal purchase. 9660 S. Mason Montgomery Road, Mason, Ohio 45040. (513) 336-9943. Check directly with the Applebees in your neighborhoods to see if they have similar offers. Pizza Tower – This is one of my kids favorite places to go (see my previous post) and on Wednesday nights (4-9pm) two kids can eat free with an adult meal purchase of at least $5. They get their choice of a one topping personal pizza. Drinks are not included but a small ice cream cup is. They also give them fresh pizza dough to play with that they can shape into animals or some creative creation. My go to masterpiece is the snowman. 8945 Governors Way, Cincinnati, Ohio 45249. (513) 683-8400. Skyline Chili – Locations vary on the nights they do Kids’ Eat Free so just double check with your local Skyline before heading out. Thanks to reader, Patterson, for adding that Wednesday is another popular night for Skyline’s Kids’ Eat Free night. Captain D’s– Check with your local Captain D’s to see if they participate in Kid’s Day on Thursdays. Their national website shows that two kids can get a free kids’ meal with an adult entree purchase at regular price. They also have a birthday club and kids will get a free kids’ meal coupon for their birthday. Qdoba – On Friday nights, the Qdoba in Deerfield Townhip and the Qdoba in Florence (say hi to Jenn!) & Qdoba Blue Ash have Family Night. Kids 12 and under eat free with an adult entree purchase after 4pm. They have some yummy options for you and your kids that they prepare right before your eyes. Check with your local Qdoba’s before heading out to see if they have Family Night since stores may differ on local promotions. Izzy’s Restaurants – Having a kids eat free Saturday option is great. Head to the home of the “World’s Greatest Reubens” at their Fort Wright, Florence, Anderson, Red Bank, Forest Park, Western Hills, and West Chester locations and kids (14 and under) will eat free with an adult meal purchase. Plus this is valid all day (dine in only). El Mariachi – “El Mariachi in Hebron (but NOT Harrison) has free kids meals on Sunday.” – LoriNKY. (Looks like this deal is good for a limit of 2 kids per party/table – with 2 kids eat free with the purchase of 2 adult meals and drinks). Toot’s – They offer a free hot dog basket meal (drink not included but ice cream is) every day, all day. Up to two kids (ages 10 and under) get the free hot dog basket with each adult purchase. Toot’s also has a kid’s eat free night on Tuesdays and they always have coupons and specials on their website (see their kids color coupons – color a picture for a free kid’s meal). 12191 Montgomery Road, Loveland, Ohio. (513) 697-9100. Fricker’s – The Savings Lifestyle did the research for us (thank you Becky) and found that not only do the Dayton area Fricker’s offer kids eat free all day every day, but so do the Fricker’s in Middletown and North College Hill. We also now have locations in West Chester and Mason. Bob Evans – I think Bob Evan’s has a really nice selection of kids’ meals plus they give you lots of healthier side choice options (broccoli, yogurt, fruit, carrots and more). Drinks are not included. Sign up for their birthday club and your kids can get a free kids meal on their birthday. Sonic & Steak-n-Shake – Each have a happy hour during the week. You can get 1/2 price drinks and slushies at Sonic and 1/2 price milkshakes at Steak-n-Shake. Offer valid M-F, 2-4pm. And, if you feel a craving for a shake late at night, Steak-n-Shake also offers this deal from 2-4am. If you sign up for Sonic’s birthday club, they’ll send your child a free coupon for a free Wacky Pack kids meal to use. CiCi’s Pizza – You can get some great deals by signing up for CiCi’s Pizza Perks coupons. Occasionally there will be Kids Eat Free with paying adult coupons, but no matter what there are great deals. Know of a restaurant offering a Cincinnati Kids Eat Free night that we missed? Please share it in the comments! Also, because restaurant promotions are constantly changing we recommend calling the restaurant before heading out, just to make sure. We’ll do our best to keep this updated, but just in case…. call. developing the drug as a dietary regimen for losing weight. believe that some times the experience of real people has not caught up with science for documentation. you want to make sure that you’re using a good pair of tweezers. It is often mixed with other oils to keep cost down but still provide benefits. apasiona el mundo digitado. Un cumplido a todos aquellos que leen este mensaje. Hola, me ha gustado asaz esta publicación. De hecho he optado por registrarme en la web. Así poder seguir de tapia más aportes tal este. trabajo en España y me apasiona el mundo digital. Un agasajo a todos los que hayan docto este mensaje. the next day. You can conveniently switch the radiant cook surface with grilling elements. project for women in smaller homes. that it delivers a massive number of sports Letmewatchthiss to choose from. (Sorry Jason, we don’t want a white Mormon president from Utah. Sadly, Tropical Smoothie Cafe in Mason at Voice of America is closed. 🙁 I think the closest one now is up by Dayton. Love that I stumbled on this list. Very helpful. Thank you! That is sad. Thanks for letting us know Kristen! Kids eat free at the Chilis in Springdale and the Applebees in Fairfield (Fairfield on the Green area) on Tuesday nights! The skyline in Anderson on Beechmont near Markley has their kids eat free on Tuesday nights. IHOP has kids eat free every day after 4:00 with the purchase of an adult meal. Doesn’t include a drink. kind of info in such a perfect manner of writing? I think Bayou Fish House closed down. The rapidly meals behemoth that is Burger King was started out as a restaurant referred to as “Insta-Burger King” in Jacksonville, Florida, in 1953. The company has given that expanded not only nationally inside the United States, but internationally as properly. Went to Viva Tequila this past Sunday for the kids eat free as we do quite often. After we got our check we were told they discontinued it. The guy did take 7 bucks off the bill for the misunderstanding which was nice of him. Food was good as usual. Pat THANK YOU for letting us know. We’ll remove them from the post. Nice that they still honored it. Captain D’s in Florence ky has kids eat free all day everyday now! Yay! Kids no longer eat free at Toot’s on Tuesday nights. Rooster’s on Route 4 Springdale. Tuesdays 2 kids eat for free per paying adult with a $10 purchase. I called Viva Tequila this past Thursday and they said they were no longer doing Kids Eat Free. Oh well. I am hesitant to suggest this because we just found it. Last week my husband, 3 step kids and I went here. It was so great, not crowded at all and the food was very tasty. This is our new secret place. Monday and Wednesday, one free kid’s meal per paying adult. As of June 1, 2012 – the Houston Rd. Chick fil a no longer has kids eat free nights. Katharine – THANK YOU for letting us know. We’ll make that note above. I signed up for coupons for Cici’s Pizza (there is one located in the Jungle Jims strip mall) and I sometimes get Kids Eat Free with paying adult coupons from them. They have a magician on Wednesday nights who does tricks at your table. The kids love him, and he waits until you’re pretty much done eating to entertain. Thanks for the tips. I wish we still had a Cici’s near us. Might have to visit Jungle Gyms soon and stop there. So Skyline is Kid Eat Free on Wednesday night at most locations. The Blue Ash Skyline is the only Kids Eat Free on Monday Nights. Kids eat free at Oakbrook Cafe on Tuesdays. I wouldn’t recommend it though. It took a half hour to get our food and there was no one in the place. Too much of a bar atmosphere to take kids. They considered buying milk was making the place kids friendly. Too bad, because the food was very good. Culvers in Florence on 42 – Kids eat free on Tuesdays and they have crafts. Brazenhead in Mason has free kids meals on Tuesdays. bob evans has kids eat free day of and next day every time the reds win. Just received an e-mail from Fazoli’s. Two kids can eat for 99 cents each with one adult purchase on Tuesdays from 5-8pm. There will also be crafts. Another great Kids Eat Free idea is Izzy’s–kids eat free on Saturdays at the Western Hills location. Wow, love that the recommendations keep coming. I just added Texas Roadhouse (.99/meals), Bourbon House Pizza, Hofbrauhaus and Lonestar Steakhouse to our reader recommendations. Thanks so much everyone. Tuesday is still the kids night out champ! texas roadhouse has 99cent kids meals tonight for kids night! 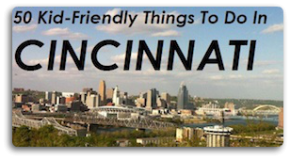 @famfriendlycin – THX for the shout out yesterday! Lonestar Steakhouse has kids eat free off the kids menu all day Tuesday. They used to do this from 12-4 on Saturdays also, but I could not find that on the website when looking. My daughter loves to get a kids steak and sweet potato. Kids eat free with the purchase of adult entree at the Hofbrauhaus in Newport, KY. I *think* from reading her post, it got switched to Tues night. I asked her to come let you know. Cathy – Did they say they are discontinuing the deal? We def. want to take it down if it’s not being offered any more. Thanks so much for letting us know! Just went to Chammps tonight (Monday), and they no longer have Kids Eat Free on Monday nights. The hostess kindly explained that it is now on Tuesday nights, since two weeks ago or so. It’s a good thing I asked before I sat down with my 3 hungry children, although the empty parking lot and restaurant were obvious bad omens! We kindly walked out and went to LaRosa’s. Bourbon House Pizza on Oakbrook Dr in Florence, KY. Kids eat free on Tuesdays. Stopped by the CHik Fil A in Florence today and learned they do Kids Eat Free on Monday during lunch with the purchase of an Adult meal. That’s in addition to the Tuesday night offer. Gotta Love Kids Eat Free!!! Just drive by Chilis in Tri- county and they had a sign that said kids eat free on Mondays and Tuesdays. You should sign up for their emails too. They are always having good bogo deals and other discounts. I love and appreciate this! thank YOU! Thanks for all the great suggestions, I’ll be adding these to our listing as reader’s recommendations very soon. Hey, as an FYI, Margarita’s in Cold Spring has Kids Eat Free every Wednesday. Kim – so glad I don’t have to hop on the scale. lol. Here’s another. Abuelo’s Mexican Resturants have “Kids pay what they weigh” on Monday and Tuesday. So if your child weighs 45 lbs, their meal is only 45 cents! Heather – great suggestions. Thanks for adding to the post. Thanks for these additions Heather! I would love to see Northern KY restaurants on the list too!! So far I know Skyline in Independence kids eat free on Sundays and Tuesdays at Max and Erma’s in Crestview they eat free too!! Steak and Shake is all weekend free too! Bard’s Burgers (3620 Decoursey Avenue, Covington) does a kids eat free from 4p-8p on Tuesdays with the purchase of an adult meal. They update via facebook: http://www.facebook.com/bards.burgers. You missed our favorite: Kids eat free at Steak-n-Shake on Saturday and Sunday. El Mariachi in Hebron (but NOT Harrison) has free kids meals on Sunday. The Hebron Gold Star also definitely does kids night on Tuesday nights. Our kids love Dan the Balloon Man. Also, Beef O’ Brady’s in Hebron has $1.49 kids meals on Tuesday nights. We love the Spaghetti-a-plenty nights at LaRosa’s! 4 of us eat for under $20. It’s great! How could I forget the LaRosa’s deal – we’ve done the spaghetti meal many a times. Thanks Joie for the tip. Thanks Kellie about Max & Erma’s too. Max and Erma’s offers 1 free children’s meal per paying adult on Mondays and Tuesdays. Thank you! Another one for your list: Not exactly free, but on Mondays and Tuesdays LaRosas has an all you can eat spaghetti deal. Adults are $4.99 and kids are only $.99! They apple slices, a drink, and as much spaghetti as they can eat. Not bad for a dollar!